This year stock market also says Happy Diwali to Investors, as sensex scales to fresh life time high 21239. For next year also analysts are positive and they see upward movement in stock market. 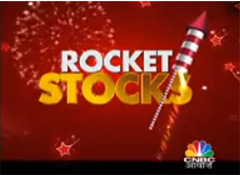 This diwali CNBC Awaaz has taken opinion from 9 different stock market analysts to know Rocket stocks for 2014. Rocket stocks are stock that are expected to fire like rocket & shall give magnificent returns like rocket. We are herewith details of 16 Rocket stocks by CNBC Awaaz for 2014. Do you think that these stocks can give good returns in 2014? Do you think that expert has suggested right stocks for investment?